Acer has gone from strength to strength over the past few years, offering a staggering range of high-quality laptops at affordable prices. Its Aspire 5551-P32G32Mn strikes a nice balance between power and mobility and has a lot to offer for such a low price. Built around a 15.6-inch screen, the 2.6kg chassis is nice and light for its size. While its 207-minute battery life is slightly bettered by the HP 620, it provides adequate mobility for commuting or use around the home. The impressive design quality seen throughout this machine shows Acer's commitment to the entry-level market. With its faux-metallic palmrest and resilient textured plastic lid, this laptop is tougher than many you'll find at this price and will take the knocks of family life. The quality of Acer's laptop keyboards is another area that has impressed of late and this model is no exception. The flat keys may not suit all tastes, but the spacious, responsive board moves exceptionally well and is a pleasure to use, even for extended periods of time. The 15.6-inch screen is equally pleasing, with impressive brightness, accurate colours and striking contrast. Its 1366 x 768-pixel resolution isn't quite as sharp as we would like, but is standard for this price point and sharp enough for most tasks. While this laptop doesn't use Intel technology, its dual-core AMD processor is a more than capable choice. Speeding through single tasks with ease, it shows its limits when multitasking, but there is ample power on offer for internet browsing and office use. The integrated ATi graphics card is built to smoothly process high-definition (HD) video and offers plenty of power for basic photo and video editing. Inevitably at this low price gaming is not possible. Where the Acer again betters its rivals is its network connectivity and excellent software package. It features both 802.11n Wi-Fi and Gigabit Ethernet support, the fastest wireless and fixed network connections are possible. 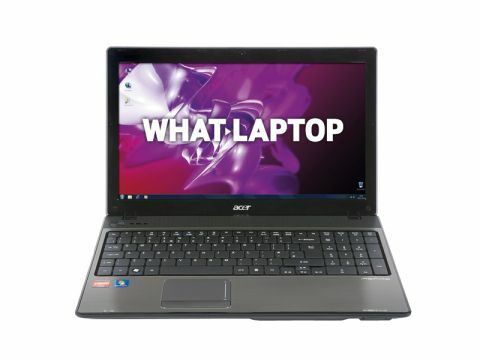 Market-leading software for basic home office use, online data backup, DVD playback and disc creation are also included, among others, helping you get started straightaway – a rarity at this price and a key selling point of this laptop. Offering impressive performance, great usability, a stunning screen and cutting-edge connectivity, the Aspire 5551-P32G32Mn is perfect for first-time buyers. Add its surprisingly generous software package and you've got a fantastic bargain on your hands.